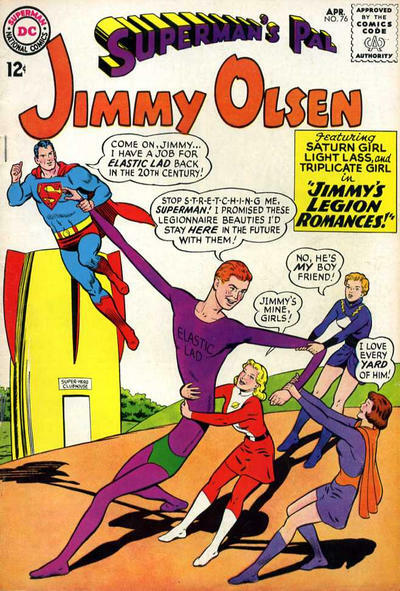 The Superman Fan Podcast: Episode #368 Part II: Superman Family Comic Book Cover Dated April 1964: Superman's Pal Jimmy Olsen #76! Episode #368 Part II: Superman Family Comic Book Cover Dated April 1964: Superman's Pal Jimmy Olsen #76! Superman's Pal Jimmy Olsen 76, April 1964! This 500TH individual episode features SUPERMAN'S PAL JIMMY OLSEN 76, April 1964, published on February 27, 1964 (26 years before my son's birthday). It contained 32 pages for the cover price of 12¢.The editor was Mort Weisinger, and the cover was pencilled by Curt Swan, inked by George Klein and lettered by Ira Schnapp. - ELASTIC LAD AND HIS LEGION ROMANCES (9 pgs. ), written by Jerry Siegel and drawn by John Forte. This was Siegel's 79th silver age Superman Family story, and his 124th overall for the era. The story was reprinted in ADVENTURE COMICS 503, September 1983, published on June 2, 1983. It contained 100 pages for the cover price of $1.25. This issue was also the final issue of the series, which began as NEW COMICS, cover dated December 1935, published around November 2, 1935. It was the second series published by the company that would become DC Comics as we know it today, after NEW FUN COMICS 1, cover date February 1935, published on January 11, 1935. - THE DEATH MARCH (9 pgs. ), written by Leo Dorfman and drawn by Al Plastino. It was reprinted in SUPERMAN FAMILY 164 (which continued the numbering of Jimmy Olsen's title), the April/May 1974 issue, published on January 24, 1974. It contained 100 pages for the cover price of 60¢. - THE GOOSE WITH THE GOLDEN EGG (8 pgs. ), writer unknown, pencilled by Curt Swan and inked by George Klein. Elsewhere in DC Comics, 31 titles carried the April or April/May 1964 cover date, according to Mike's Amazing World Of DC Comics. Next Episodes: SUPERMAN FAMILY COMIC BOOKS COVER DATED MAY 1964: PART I: WORLD'S FINEST COMICS 141 (Mort Weisinger's first issue as editor) & PART II: SUPERMAN'S GIRL FRIEND LOIS LANE 49! Thank you for listening to these 500 episodes of THE SUPERMAN FAN PODCAST, and here's to 500 more! Congratulations on your 500th episode! What an accomplishment! I hope I'm around for your 1000th, and I like your ideas for what to do after you complete the Silver Age run of the Superman family of comics. You mentioned the "Great DC Contest", and being unable to find a comic story with that title. That's because it wasn't the name of a story. It refers to Superman #169, and a contest to find the letters D and C somewhere in the issue. Also, in the recent Episode 111 of his Superman Forever Radio Podcast, Bob Fisher talks with Dr. Hendrie Weisinger, son of Mort Weisinger, and he talks about this contest at one point. That episode is well worth a listen. Thanks for the info. I thought about that story and wondered if that was what it referred to. I'll have to check out that episode. Thanks for the plug.